So, I really, really loved GTA IV, and I genuinely don’t think I’d be as into gaming as I am now if I hadn’t have played it. I was so excited for GTA V back when it came out on PS3, and my excitement carried me through a good couple of weeks after it initially released and I played it solidly. The excitement wore off pretty quickly, and I just couldn’t get as into it as I had with its predecessor. Eventually, I stopped playing altogether and still haven’t been back to it, some four years later. In 2008 my boyfriend came home with the bright idea of buying a PS3. Never one to think about huge purchases, I soon agreed and it wasn’t long before we were in the town centre figuring out which deals were best, and eventually the console was purchased. One of the games we’d bought was GTA IV. I’d dabbled previously in GTA games but never really persevered with one long enough for it to have made much of an impact. GTA IV was a different story. From the moment I saw it being played I knew I wanted to be involved. I spent most of my free time playing the game after that. 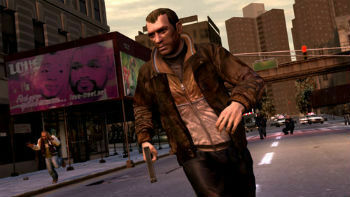 When I wasn’t doing work for my university course, or at classes, I wanted to be playing GTA IV. I became so ridiculously immersed in the game, I started talking in a Russian accent just like Niko. My flatmate said she always knew when I was playing because she’d hear me shouting and swearing at (and with) the game. GTA IV is the first game I can remember getting emotionally invested in on such a level that I just didn’t want to play the game anymore, as much as I was enjoying it. Why should I get to play God? Can’t Kate and Roman both live? The choice seemed obvious, family first, but Kate might be the one. I know in the past I’ve harped on about loving games that have decisions in them, but this seemed to be one decision too far. I downed controller shortly after the decision came up. I needed time to think about this. The decision that followed I have erased from my mind. I think I chose to kill Roman, but I can’t say for sure. On the cusp of GTA V, I wonder if any game will ever have as much of an impact on me as GTA IV. I can safely say, without it, I wouldn’t be as remotely into gaming as I am now. GTA IV was a real platform for me and launched me from being a casual gamer to whatever I am now. Time will only tell about how GTA V will affect my life, but it sure is exciting waiting to find out.